Turkey’s operation against the Kurdish-held northwestern Syrian enclave of Afrin is seen by many Turks as a necessary security measure, but it has few plaudits in the country’s Kurdish-majority southeast, left-wing newspaper Evrensel said. 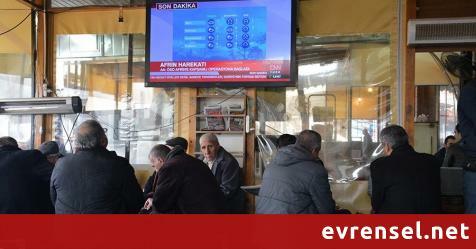 The newspaper sent reporters to the southeastern cities of Antep, Diyarbakır, Şırnak, Malatya, Elazığ and Urfa to ask people in the streets and coffee shops what they thought of the operation. Ali, the manager of the coffee shop in Düztepe neighbourhood in Antep, told the paper there was no way any more to protest the move. “Now look, we haven’t been able to go out on the streets to say no to war,” Evrensel quoted him as saying. The people at a tobacco shop in Antep told the newspaper they did not believe the justification for the intervention. İhsan Doğan, a retiree, told the paper that it he saw the operation as being carried out by the ruling Justice and Development Party (AKP) for domestic political gain. “The AKP knows that it is finished, and it is doing this just in order to get the people behind it,” he said. Afrin operasyonuna Antep, Diyarbakır, Şırnak, Malatya, Elazığ ve Urfa'da yaşayan yurttaşlardan tepki: İnsanların ölmesine taraftar olamayız.